In Part I of this series, I covered some of the basic functionality of the Commodore 64 and my trials and tribulations in getting mine to work properly. In Part 2 I will talk disk drives and disk images. Before I can talk about the Ultimate-1541, I need to discuss the Commodore 1541 Disk Drive and how the C64 deals with floppy disks, the other major storage medium for NTSC C64 users. The Commodore 1541 Disk Drive is an external 5.25" floppy disk drive which connects to the C64 via the 6-pin serial port. The 1541 had its own power supply and its own 6502 CPU, 16KB of ROM and 2KB of RAM, it was essentially a computer of its own. The disks used were standard double density disks, but the drive was a single sided drive like the drives for the contemporary Apple and Atari home computers. The IBM PC used single sided drives for the first year of its existence. Like the Atari drives, you turn on your drive first, then the computer. Blu-ray disc may not have been as successful as DVDs, but its capabilities have allowed it to embrace and do some justice to unusual film formats. Let's discuss some of them. For screenshots, I will refer the reader to the Blu-ray.com article with the appropriate links (when available), which has excellent, multiple full-HD screenshots for most of the films I will be discussing here. All Blu-ray covers are taken from Amazon.com or Amazon.co.uk with one exception noted below. A couple of years ago, I had traded my Atari 800 for a Commodore 64. The C64 was a breadbin model and while it had a power supply, it did not come with a disk drive or any software other than a single cartridge. When I took it home, I noticed that the keyboard was extremely stiff with some of the keys on the left side barely registering to keypresses. In July of 2016, Krikzz finally released his long anticipated EverDrive flash cart for the Game Boy Advance. He called it the EverDrive GBA X5 and sells it for $99.99 on his site and through his authorized vendors. I bought mine on his annual Black Friday sale for 20% off, so it ended up costing me $87.00, shipping to the USA (from Ukraine) included. The "X5" in the name represents a new branding of his product lines. His new products will be released with an X3, X5 and X7 designation. Each designation indicates the feature support of the flash cart relative to a desired feature set for flash carts. The designation is not tied to the products released for any particular console. For example, the Mega EverDrive X7 has save state support whereas the X5 and X3 do not. 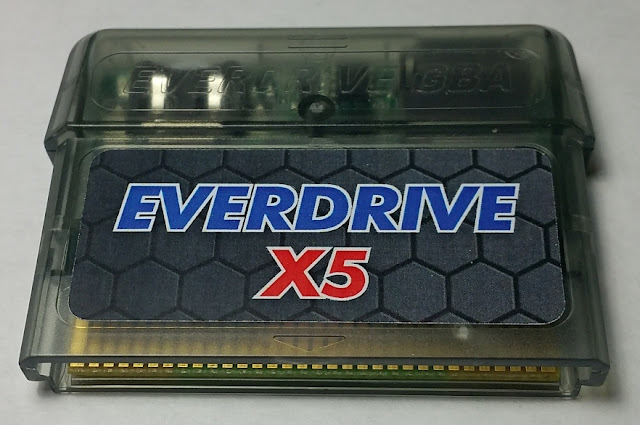 Furthermore, the MegaEverDrive X7 and X5 support saving games without resetting the console whereas the X3 requires pressing reset to save or you lose your save games. Krikzz has not officially used the X designation for his products except those released for the GBA and Sega Genesis. There is no such thing as a GBA X7 or X3 and Krikzz has no current plans to make any other GBA flash carts.